Lubricants play a vital role in various industries such as automotive, industrial, and marine. They help reduce friction and wear and tear of operating parts of machines. Lubricants possess properties such as high boiling point, high viscosity index, corrosion prevention, thermal stability, low freezing point, and high resistivity to oxidation. They extend the shelf-life of mechanical parts, thereby providing higher efficiency. Lubricants are employed to facilitate smooth operation of mechanical parts and eliminate any residues deposited on these parts. Key lubricant products include metalworking fluids, process oil, transformer oil, industrial lubes & greases, and industrial oil. The global lubricants market has been segmented based on type, product, and application. In terms of product, the market has been classified into mineral, synthetic, and semi-synthetic. Mineral was the leading segment of the market in 2017. Mineral-based lubricants are available at lower cost than synthetic and semi-synthetic lubricants. They contain large number of hydrocarbon compounds and organic compounds of oxygen, sulfur, and nitrogen. These hydrocarbons can result in the development of dirty oil, acid, and oxidation instability. This can create irregular lubrication in the engine. The challenge of mineral lubricants containing group I base oil is to deliver fuel economy at lower viscosity, without affecting engine durability. Therefore, increase in limitations on using conventional mineral oil base stock for formulating lubricants is boosting the demand for synthetic lubricants that contain higher quality base stocks such as PAO and API Group V based lubricants. Rise in emphasis on engine downsizing; and increase in usage of turbocharging, direct injection, and exhaust gas recirculation are driving the need for high purity lubricating oils, such as synthetic as well as semi-synthetic, that offer improved viscosity index and thermal and oxidative stability to maintain thermal and oxidative stability at longer or equal drain intervals. In terms of product, the global lubricants market has been divided into automotive oils, industrial oils, metalworking fluids, hydraulic oils, process oils, marine oils, and greases & others. The automotive oils segment has been sub-segmented into engine oils and transmission oils. The automotive oils segment dominated the global lubricants market in 2017. Rise in demand for engine oils that prevent metal-to-metal contact; reduce friction inside an engine; and provide improved wear protection, lower volatility, higher viscosity index, and better thermal and oxidative stability is expected to boost the demand for automotive oils during the forecast period. Demand for hydraulic oils is also anticipated to gain momentum in the market during the forecast period. Hydraulic oils transfer potential or kinetic energy, thus creating volume flow between hydraulic equipment such as pump and hydrostatic motors. These oils reduce wear and tear of parts that rub against each other and also protect the system from corrosion. 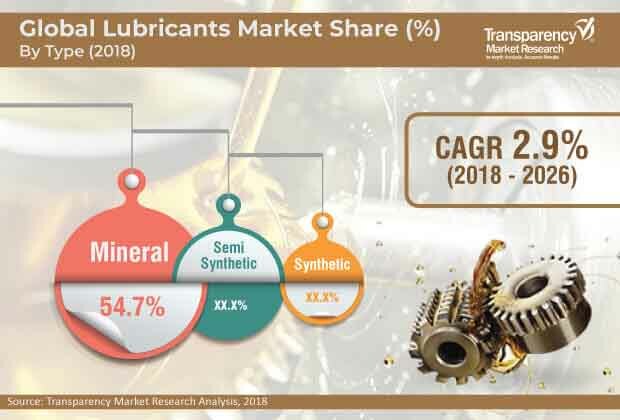 The global lubricants market is driven by the increase in application of hydraulic oils in car automatic transmissions, brakes, power steering, and industrial machines (such as tractors and other farm equipment, forklift trucks, and bulldozers). In terms of application, the global lubricants market has been segregated into automotive, industrial, and marine. Rapid industrialization has boosted the demand for lubricants in various end-use industries. Expansion of industries such as industrial machinery, automotive, and energy in developing economies such as China, India, Brazil, and South Africa is fuelling the demand for lubricants and their derivatives such as finished lubricants. Growth in global population and rise in demand for automobiles with improved fuel efficiency are driving the demand for lubricants in the global automotive industry. Demand for lubricants in the industrial sector is expected to increase significantly during the forecast period. Industrial lubricants possess strong corrosion protection properties and help extend equipment life. They are used in various equipment. Industrial lubricants also help achieve high productivity and improve the efficiency of machineries. In terms of region, the global lubricants market has been split into North America, Europe, Asia Pacific, Latin America, and Middle East & Africa. Asia Pacific was the leading consumer of lubricants in 2017. It was followed by Europe. China, India, and ASEAN are expected to offer lucrative opportunities to the lubricants market in Asia Pacific in the near future. Rapid industrialization, rise in urbanization, and increase in foreign direct investments in automotive, industrial machinery industries, etc. are boosting the demand for lubricants in Asia Pacific. Rise in demand for industrial oils to increase productivity and efficiency of fracturing pumps and equipment in the U.S. is propelling the lubricants market in the country. Germany, the U.K., and Russia in Europe are estimated to provide lucrative opportunities to manufacturers of lubricants, due to the increase in sale of passenger vehicles in these countries. Implementation of stringent regulations on vehicular emissions and increase in government pressure on OEMs to manufacture fuel efficient engines in Europe are boosting the market in the region. Latin America and Middle East & Africa are the least attractive regions of the global lubricants market. Presence of limited number of automotive producers is hampering the lubricants market in these regions. Key players operating in the global lubricants market include Royal Dutch Shell Plc., Calumet Specialty Products Partners, L.P, PetroChina Company Limited, Total Group, China Petrochemical Corporation (Sinopec Group), JXTG Nippon Oil & Energy Corporation, Idemitsu Kosan Co., Ltd., FUCHS, Gulf Oil Marine Ltd., BP plc., Petroliam Nasional Berhad (PETRONAS), Chevron Corporation, and ExxonMobil Corporation.